Pain is a common concern among individuals who are considering dental implants. As with any major dental procedure (or surgery in general), some discomfort is to be expected during the recovery process since it is a surgery that typically involves removing teeth, cutting gums, drilling into the jawbone and inserting a titanium post. It must be planned and executed carefully so complications, side effects and unnecessary pain can be avoided which is why finding a quality dentist is so important. Will There be Pain During the Surgery? The procedure itself is not painful since it is performed with either general or local anesthesia to completely numb your mouth. If you’re anxious about the discomfort during the procedure and being aware of the drilling noises and forces being applied to your mouth, ask your dentist about the available sedative options and suggest that you be put to sleep. Once the numbness wears off, however, pain is one of the first things you’ll notice. While a small number of patients experience a considerable amount of discomfort after the surgery (usually due to a complication or failed implant), most people find it and recovery not nearly as painful as they expected it to be. Depending on where it was placed, discomfort can also be felt in the chin, cheeks or underneath the eyes. Patients say that the aching they experience is roughly the same as after having a root canal done or getting a tooth pulled. Overall, patients report that the results are well worth the process. The procedure should be completely trouble-free, but there can be some discomfort. Your surgeon will perform the operation with local or general anesthesia so that your gums and jaw are completely numb. You might hear/feel the tools being used, but no agony should be experienced. Those who have a phobia of dental/surgical procedures can opt for general anesthesia (injected or inhaled), which allows them to be unconscious the entire time. 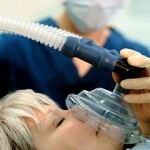 Sedatives can help you relax if you are nervous about procedure. Also, it is important to have some way of communicating with the surgeon if the anesthetic wears off while they are being installed. While this is extremely rare, it is better to be safe than sorry! Will There be Pain After Surgery? The complexity of the operation can impact the amount and duration of soreness afterwards. Having a bone graft or sinus lift done before your surgery will typically cause additional tenderness afterwards. You may also experience side effects such as bruising, swelling and bleeding to a certain degree depending on your gum and bone health. The experience varies from person to person and depends on how quickly they heal. Almost all of the swelling should be gone in the first 3-5 days after the surgery and the pain should be almost completely gone after 7-10 days. If you notice any signs of swelling, infection or irritation after the timelines mentioned above, you should seek medical attention. They can check the implants and surrounding gum tissue and repair and minor problems. If these signs last for more than two or three weeks then something might be wrong with it. With plenty of rest, painkillers, and ice packs, you should be able to minimize the amount of pain you experience after your surgery. A few days of pain and discomfort is a small price to pay for long-term dental health and a great looking smile. There are a number of ways to minimize the soreness you experience during the 7 to 10 day healing period after. Most importantly, find a dentist or surgeon who has extensive training and experience. I highly advise against choosing the dentist who offers the lowest prices. Follow the post-procedure instructions that you are given carefully. 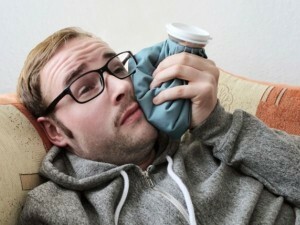 Your dentist will recommend that you take painkillers following the procedure to alleviate the discomfort. Ibuprofen is typically recommended. If you choose to take it, you should take around 600mg every eight hours or so. If this does not relieve your pain, tell the dentist so they can prescribe something stronger. Used an ice pack (or a bag of frozen vegetables) to reduce the swelling. Apply it to your cheek or lip as soon as you can after you get home. Bathe your gums (don’t swish or gargle) in warm salt water. Avoid solid/hard foods to prevent irritation. Cold and soft foods like ice cream, smoothies and yogurt are ideal. Pay extra special attention to your oral hygiene. Get plenty of rest and don’t do anything strenuous to let the healing process do its thing. If the pain gets worse, lasts longer than it should or is abnormally strong, contact a medical professional immediately to avoid serious problems. There are a number of possible complications that can arise during and after surgery that can cause additional discomfort. The small screw that is placed in the top of the implant while the gum is healing becomes loose. The cap must be removed, cleaned and re-fitted. Insufficient bone volume, external pressures/forces and more can cause it to become loose. It must be removed in most cases. In rare cases, the heat of the drill can damage the bone surrounding the post. The prosthetic and dead bone must be removed. Gum or bone can become infected. This can be treated with antibiotics. A nerve is damaged by the drilling or the post is placed too close to it. Artificial tooth must be removed and redone if it is safe to do so. The patient’s body rejects the implant. Solutions include trying another type or an alternative solution. If you’ve had implant(s) done, what was the pain like? How did the procedure go? Let us know in the comments! i had 18 teeth pulled and 12 implants installed at the same procedure, 2 of the implants went high into my cheek bone…i paid extra to be put to sleep….its been 6 days and its been pretty painful…i only use ibuprofen as i don’t want addictive painkillers….most of the pain is gone now except the temporary teeth for the bottom which are removable made a hole right under my bottom front teeth that hurts like hell…..hopefully it will be worth it….. I had two implants put in three weeks ago. Is it normal that I can’t open my mouth wide enough to eat and can barely put in my partial. The swallowing has gone down but I can’t open my mouth wide. It’s​ still hard and painful to chew food. I was wondering if this is normal?